One of the lovely things you have to deal with when raising a puppy is the burning desire to put anything and everything into its mouth. You can imagine the fun we're having on walks, right? We have lots of rabbits (which is weird because we also have lots of coyotes - or rather, maybe that makes sense, more coyote food...), especially in the nearby neighborhood park and every morning, those rabbits must have their morning "constitutions" just before we arrive because there's always FRESH TREATS on our path. Woo. Hoo. It's challenging enough to walk a puppy who doesn't yet fully understand the concept of a leash, but to also then try to avoid the rabbit pellets scattered on the sidewalk while a sneaky puppy snout darts around to gobble them up, is like asking Heidi Montag to explain Schrodinger's Equation. The best I can do is try to limit the number of pellets he snags. At least he isn't eating his own poo. It's the little things. We've been watching lots of the Olympics and during the time is was raining and too warm in Vancouver, all I could think about was how much energy they were wasting to fight Mother Nature and keep snow on the ground. I know - I'm weird. I have an aversion to wasting anything (as a side note - I checked my gas bill and we are using 14% less per day with the new tankless water heater). The other thing I realized was that, while my height is useless in most Olympics sports other than gymnastics and figure skating, it appears that my height would be good for mogul skiing. Those chicks were short! I like it! 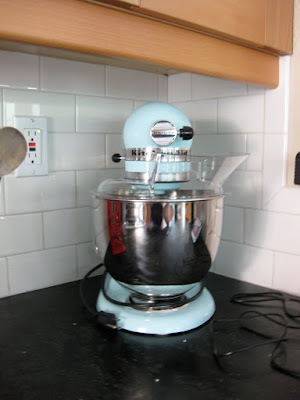 Monday afternoon, the new KitchenAid mixer arrived. I know. You are thinking, "Woman, you're husband is unemployed, why are you buying an 80 million dollar mixer?!" The answer is, had my in-laws written "tankless water heater" in the "for:" memo of our Christmas gift checks rather than "Kitchen Aid Mixer" then we would not have one sitting on the counter right now. Really, I mean, that money could have been used for that surprise $2000 hemorrhage last month, but it's hard to do that knowing someone gave you hard-earned money for something very specific. So there it is. This piece of equipment better last a flippin' long time, that's all I have to say. At least it matches my red and blue/turquoise kitchen color theme. Congratulations! You will love it dearly. I don't know a singler person who doesn't. Too funny with the bunny poo. It seems like a popular theme lately. We just got a dog and she likes to eat our bunny's poo. I have heard it is ok for them to eat domestic bunny poo so I consider it a perk. (Canine vacuum cleaner) since the bunny is mostly housetrained but occasionally misses her litter box. So long as the dog doesn't eat the actual bunny we feel ahead of the game. A little rabbit poo never hurt anyone. 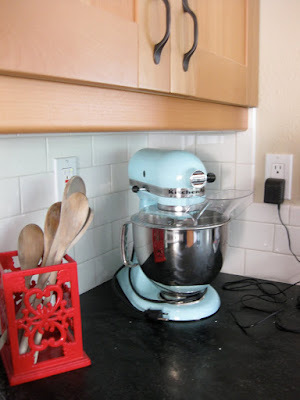 Your mixer is so pretty! We have had ours 13 years. Still like new. And weighs a ton. I know this because we store it under the cabinet. I thought the exact same thing about my height/ skiing :). I freakin' LOVE my mixer. You won't regret buying it, I promise. I have a Kitchen Aid mixer. I bought it at of all places Walmart when my son was 3. He's 17. The mixer outlasted the first marriage, it's a keeper. Well worth the investment. The first marriage...he was like a mixer that left big bitter lumps.